If you have lots of books in your bookshelf, you’ll certainly like the idea of cataloging them. A digital catalog has several advantages such as quick search and easy sharing with friends. 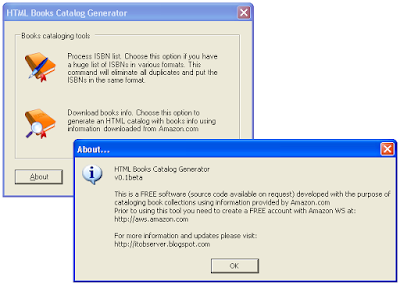 You can create a nice catalog out of your books using the following free tool. Just feed the tool with a list of ISBNs and the software does the rest by downloading books metadata, cover images and reviews from Amazon.com. The output of this software is nice HTML catalog (not in a proprietary format like other software do) which can easily be converted to a single PDF file. Click here to learn how to download this software.